When it comes to antitrust enforcement, one of the guiding principles is the effect on consumer prices. So the antitrust question of the moment is this: Will combining AT&T with Time Warner or Sprint with T-Mobile so diminish competition that prices go up? While regulators and a federal judge ponder that question, the great disrupter — Amazon — is already raising prices. Last week it said its Amazon Prime service, which includes its extensive video offerings along with free shipping and other benefits, would cost $119, a 20 percent increase from the current $99. To justify the move, Amazon cited higher costs and the fact that it’s only the second increase since it introduced its Prime service, for $79, in 2005. Still, Amazon’s move suggests a degree of pricing power that its anxious rivals can only envy. Amazon said it now had over 100 million Prime customers, and its first-quarter profit, announced last week, jumped more than 120 percent, sending its stock price soaring. Netflix, too, has been raising prices, doing so most recently in October. As the seemingly unstoppable Amazon juggernaut rolls on, there’s no doubt that media and telecommunications markets are converging and undergoing radical transformation. AT&T wants to combine its distribution channels with Time Warner’s content creation, a transaction known as vertical integration because the two companies aren’t direct competitors. While antitrust challenges to vertical combinations have been rare, the Trump Justice Department sued to block the AT&T-Time Warner merger on grounds that the combined companies might threaten to withhold Time Warner content to extract higher prices from rival distributors (a claim the companies have dismissed as economic nonsense). But Amazon is already vertically integrated — it creates content and distributes it over the internet. So are Netflix, Google (with YouTube) and Facebook (with its Watch feature and other offerings). Which is why the so-called FANG companies (Facebook, Apple, Amazon, Netflix and Google) loomed large at the just-completed AT&T-Time Warner trial and may well figure in a Sprint-T-Mobile decision, even though none of the technology giants is directly involved or is a party to the litigation. In closing arguments this week, AT&T and Time Warner’s lead trial lawyer, Daniel Petrocelli, argued that a combined company could use the kind of data about its users that is routinely collected by the tech companies to enhance its programming and offer more targeted advertising. It could use the resulting higher revenues to reduce consumer prices by what he estimated to be $500 million per year. Time Warner’s content companies, like HBO, CNN and the Turner channels, “are just islands of content unmoored from the consumer,” he said. Of course, the argument can be made that AT&T doesn’t need to buy a company like Time Warner — it could create a media content company of its own. That’s what Amazon and Netflix did, and both companies now outspend Time Warner on original programming. Whether the FANG companies compete in the same markets with AT&T and Time Warner is of more than academic interest — it could well influence Judge Richard Leon’s decision, which he said he would deliver no later than June 12. If Judge Leon does take such an expanded view of the market, AT&T and Time Warner would most likely prevail. Even if he does find some violations, he could impose conditions on the merger rather than block it entirely, much as Comcast had to accept conditions on its purchase of NBC Universal. Making a case that the proposed Sprint-T-Mobile merger would benefit consumers is far more difficult. The deal has drawn near-unanimous opposition from antitrust experts. 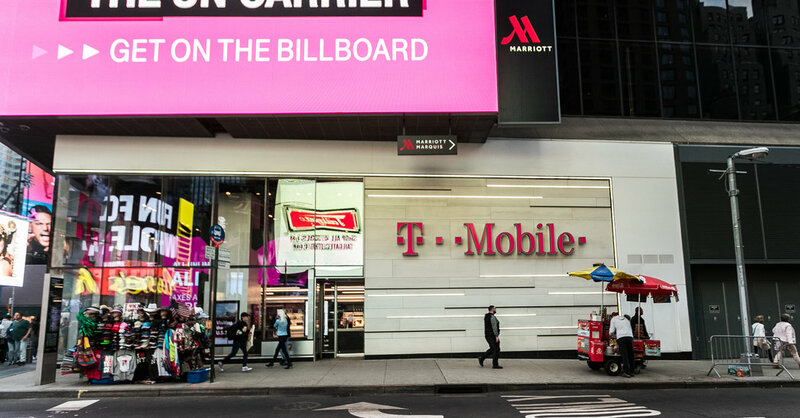 The Sprint-T-Mobile tie-up, in contrast to AT&T-Time Warner, would be a horizontal merger — a combination of direct competitors, that way reducing the number of players operating in the market. Those kinds of deals have traditionally received more antitrust scrutiny. The government rejected the same merger less than four years ago, and the result was robust competition and lower prices for wireless services — exactly what antitrust regulators fervently hope for. Before that, in 2011, the government blocked a proposed merger of AT&T and T-Mobile. So the question is whether the markets in which they compete have so changed since then that a merger now wouldn’t harm consumers. The two companies will need to argue that the market is no longer just the four wireless providers, but now includes the technology giants and broadband and cable companies like Comcast. A merged Sprint and T-Mobile would command only a small share of such a vastly expanded market, and wouldn’t have the power to raise prices. That may arguably be the case for video, which can now be streamed over wireless handsets, but not for voice calls and texting, at least not yet. Sprint and T-Mobile are talking up the potential for 5G technology to further blur the lines between traditional markets, but widespread use of 5G is still years in the future. Perhaps T-Mobile and Sprint could hold off a few years, and return with evidence that they’re actually competing with the big tech companies rather than merely anticipating that competition. Then again, given the vagaries of the Trump administration’s antitrust policies, “they may feel there’s no reason not to roll the dice now,” Mr. Hovenkamp said.